Mixed (166) - 46% of the 166 user reviews for this software are positive. We are happy to announce that the long awaited Female Portrait pack is now available for purchase in our store! The Male pack was kind of an experiment for us, but the responses were very positive, so we listened to your feedback and created the Female version of it. From now on you can represent both your male and female characters in a hand-draw fashion. To celebrate this event, we'll offer 20% discount on the Male Portrait pack between March 6th and March 13th! These Portrait packs were special to us in other ways too, as they were created in collaboration with an external artist, Peter Temesi. As you know we launched our Developer Program a while back giving everyone the opportunity to add new content to the software easily, and the created packages can be shared with other users as both free or paid content too, in which case we offer revenue share to the artist. If you are, or know someone who could be interested in creating packs make sure to let us know! We are in talks with several external artists at the moment, so once you get an idea make sure to tell us so we can coordinate with the others. We had a good amount of new users picking up the software in past couple of months, and we received several feedback regarding the difficulty of selecting packs to buy when someone first wants to dip their toes into creating characters. We came up with a solution just for those who want to start creating, but are not sure what packs to get at the beginning. 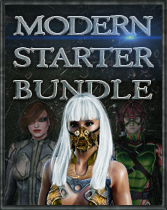 We created the Fantasy Starter and the Modern Starter bundles, where we selected 4-4 of our best selling packages from each theme, which can be used to kick start creativity. 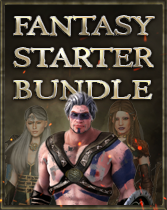 As a bonus, we introduced a massive discount on these two bundles, as they can both be purchased for only $9.99, providing a 45-67% discount compared to the original price of the packs! These bundles are available for veteran users too, who, for some reason missed out on the packs contained in these bundles, so make sure to check them out to see if these can be something for you too! We also changed the way how shopping is done in our software. Previously when you clicked the Buy button it took you directly to the Steam Store. Now prices are displayed on each unowned pack, and clicking Buy on them will take you to our internal shop screen, where you can check out the description of the pack, as well as see a few screenshots. If you decide to move forward and click Buy again you'll be presented with the usual Steam store page, where you can view additional screenshots, and make the actual purchase if you wanted to. We hope this change makes it easier for all of you to decide which packs you are interested in buying! Please let us know if you have any feedback concerning the changes, or if you have any tips on how to improve our software! The following character has been created and shared by Ashesnei on our forums in preparation for the upcoming holiday season using our very first package, the Season #1 - Human Female only. ePic Character Generator is not a game. It is an excellent tool to anyone who wants to create realistic character avatars in no time. You can simply choose what items to display on your character, save as an image on a preset or transparent background and use it for anything you would like to. You don't have to worry about lighting or finding the right camera angles, as everything has been prerendered and postworked for you, so creating characters are really just a matter of clicking some buttons! Using the Portrait package you can even create hand-drawn style images very easily. The generated images can be used in commercial products as well. You may find card games, board games and books illustrated with the images created by ePic Character Generator. If you experience any issues, bugs or want to give feedback on ways to improve our software please use the Community forum, visit our website at https://www.epicgenerator.net or send us an e-mail to support@epicgenerator.net!